Ator supports a population of fewer than 10,000 sophonts. This world contains an archaeological site with artifacts suspected to be from the now-vanished Ancients. 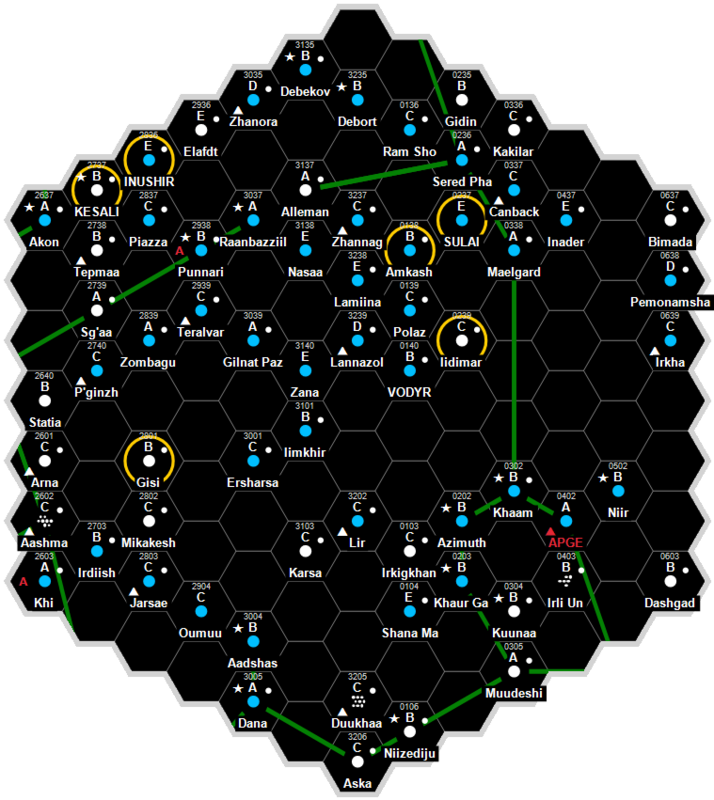 It is a Human dominated Non-Aligned world in the Darrian Subsector of Spinward Marches Sector. Ator supports a population of fewer than 10,000 sophonts. This world contains an archaeological site with artifacts suspected to be from the now-vanished Ancients. It is a member of Darrian Confederation in the Darrian Subsector of Spinward Marches Sector. This world is an Interface world, with a quarantine inspection facility for all ships. Ator was originally settled by the Darrians around -1250 as a refueling and resupply center for transport ships moving between the homeworld and colonies in Five Sisters and Plankwell Subsectors. The local population was stranded by the Maghiz, and died out around -1080, the victims of failing life support systems. In the early years of the Imperial expansion into the Marches, a Solomani extended family, the Telesco, came across the now deserted world and its Darrian settlement. Comprising about two hundred individuals, the family took over the empty base and converted it to their own use. When the Darrians returned to the system in 124, the Telescos refused to give allegiance to them or return the world to the Confederacy. When the Darrians persisted, the new inhabitants invoked eminent domain and threatened to drag the Confederacy into the Imperial courts. While the Darrians retreated from the system after this standoff, they never reconciled to the Telesco or their control, and made various attempts at pressuring them into Confederacy control. Unfortunately for their plans, the world's strategic location brought a steady stream of ships wending their way along the old Darrian trade route between Daryen and neighboring subsectors, enriching the Telescos. And the Sword Worlds were keenly interested in having the world for themselves, which led to the world being a de-facto DMZ between the two states. The world was the scene of battles between both states during the Third Frontier War, but both sides withdrew at the end of the war. This standoff would have persisted to the present day, if it hadn't been for the Sword World Landgrab of 1132. The Sword World military seized Ator in force, imprisoned the Telescos, and vandalized the starport. The Sword Worlders remained on the world until 1135, when DCN Marines ousted them after a bloody meteoric assault, and rescued the Telescos. With the starport in ruins, and having little money to rebuild, the family swallowed their pride and accepted Darrian sovereignty. The Confederacy salved their pride by reconfirming the family as Ator's hereditary governors, and by rebuilding property destroyed by the Sworld Worlders. While the Telescos have had some difficulty adjusting to their new overlords, the change in sovereignty brought new prosperity to them and their world. The closest Darrian world to the Spinward Main traffic coming up from Mirriam - Five Sisters to Flammarion, and a mere two parsecs from Debarre, most low jump traffic from the main must pass through the system. An SSIIO and its attendant RQS/DQS personnel are posted here, and the combination of customs fees, government subsidies and business from passing ship crews have made the Telescos and their people wealthy beyond anything they were in the past. Martin Dougherty, Neil Frier. Behind the Claw (Steve Jackson Games, 1998), 49. This page was last modified on 11 December 2018, at 18:33.